The book will help you navigate the DSM-5. It will assist you in learning the diagnoses as they are required by agencies and the insurance companies in order to obtain reimbursement for services. 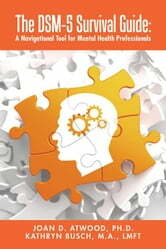 Each chapter presents the more common disorders as they are typically encountered in agencies. It is a book for mental health and human service professionals--graduate students in social work, marriage and family counseling, psychology, and mental health counselors. It is also a book for the experienced practitioner, psychiatrists, psychologists and other mental health professionals who want to stay grounded in traditional psychology or systems theory but often are required to present cases or diagnose from an individual or psychodynamic point of view. The book imparts technical knowledge in a non-technical view. it is based on the feedback from graduated students as they enter the mental health fields, and based on discussions with experienced professionals. Looking though the framework presented in this book allows practitioners to see individuals within a context and to free them from mutually exclusive outlook. Each chapter is separated into the following format: (1) a presentation of the disorder, along with the symptoms as they are typically presented, (2) a case history of someone who exhibits the disorder, (3) a description of how a therapist can recognize the disorder- for example, what does a depressed person look like, (4) a description of how the client feels, (5) The clients dilemma, (6) A brief explanation of the theories used to describe the etiology of the disorder, (7) An assessment from an individual lens, (8) An assessment from a systemic lens, (9) A list of individually based therapeutic strategies, (10) and a list of family therapy strategies that could be used for treating the client.